State Representative Bob Pritchard courtesy Bob Pritchard / Facebook. Cliff Golden (left), Keegan Donnelly (center), Bob Pritchard (right) Credit Susan Stephens / WNIJ. About a dozen Illinois lawmakers have announced they are quitting or not running for re-election. That includes Senate Minority Leader Christine Radogno, State Sen. Tim Bivins of Dixon, and State Rep. Bob Pritchard, who has represented the DeKalb area for 14 years. For this week’s Friday Forum, WNIJ’s Susan Stephens caught up with Pritchard while he was doing what he calls the best part of his job: hanging around with his constituents. On a recent hot summer afternoon, the place to be was the steamy Target parking lot in DeKalb for the annual National Night Out event. Pritchard had a booth, but wanted to get out and circulate. First stop: Boy Scout Troop 33’s brat stand. 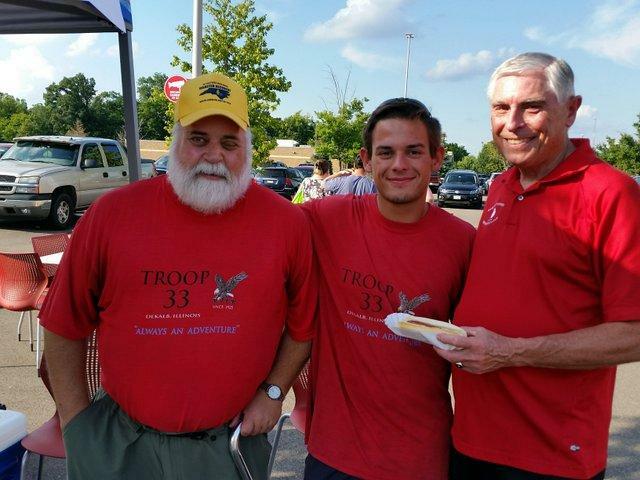 Pritchard caught up with longtime Scout leader Cliff Golden, learned about the latest Eagle Scout projects, and met Houston Bai, who travels from China every year to attend their Boy Scout Camp. Golden told Pritchard he hated to hear he wasn’t running again: Pritchard joked that it was fine because now he has more time for Scouts. The 72-year-old Republican from Hinckley is up for election next year and decided he’s not going to run again. But it can’t be easy to leave, after 14 years. Pritchard was appointed to the 70th district seat in 2003 when fellow Republican Dave Wirsing died in office. Before that, he served as DeKalb County Board Chair, was on the Hinckley-Big Rock school board, and was in agriculture-related broadcasting and public relations. As a lawmaker, he’s known for his work on education issues, particularly higher education and funding reform. 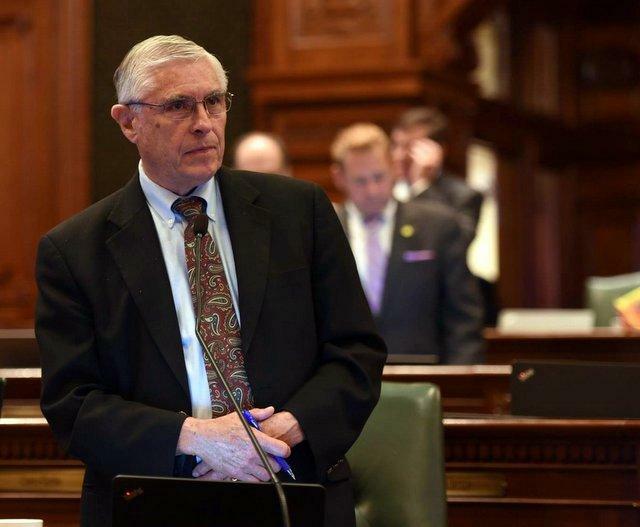 In his 14 years as a state representative, Pritchard has served under two Democratic governors – Rod Blagojevich and Pat Quinn – and one Republican, Bruce Rauner. Things have changed in Springfield, and the change that really bothers him is in the attitudes of lawmakers. He says it’s important to reflect all segments of their communities because everyone deserves a voice. So who would he vote for for 70th District representative? Pritchard says it’s too early to say. He knows he wants a representative who has a passion for interacting with people. He says the worst thing is for someone to come in with the unrealistic expectation that they can change the world, “while Mr. Madigan still controls the House.” A strong core of supporters and good organizational skills are important, and he’s ready to coach the next candidate for his seat. Pritchard says he always felt being a state lawmaker wasn’t a permanent position: People need to get in there, do the work, get pretty good at it, then go back to their pre-capitol lives. For him, it’s the family grain farm in Hinckley, where he plans to drive and run errands for his son. It’s also an opportunity to share more time with his grandchildren. With just a few months left in his term, Pritchard doesn’t plan to act like a lame duck lawmaker. His schedule’s pretty packed. There was one more stop for Pritchard, however, at National Night Out. 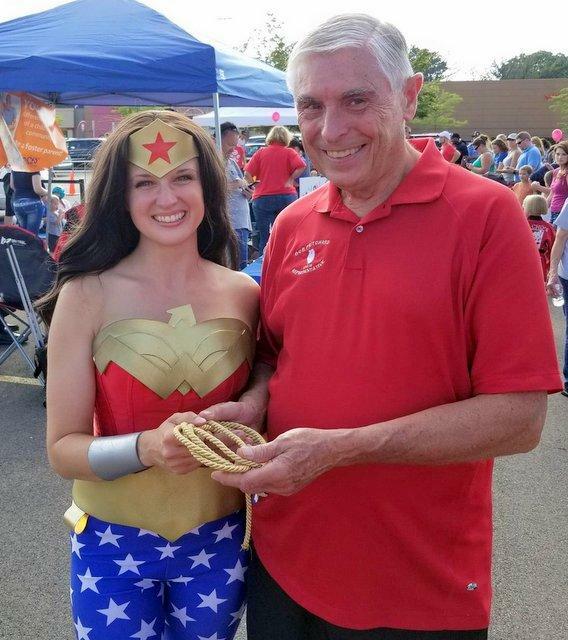 He spotted a Wonder Woman impersonator and wanted to ask if he could borrow her Lasso of Truth. The gold rope is supposed to compel people to tell the truth. That’s something he thinks would come in handy in Springfield. 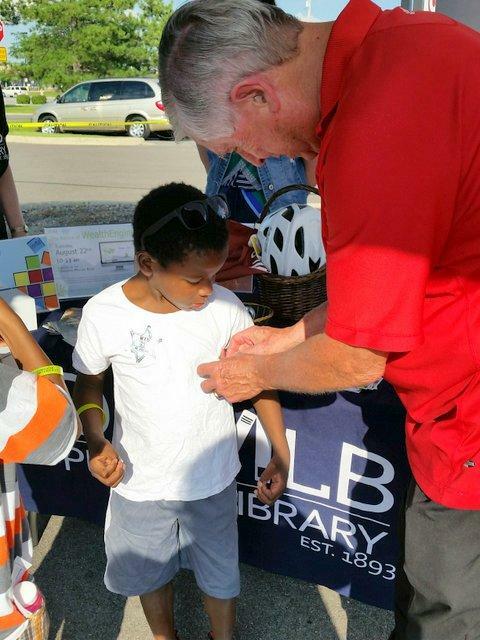 Bob Pritchard pins some library swag on a National Night Out attendee. 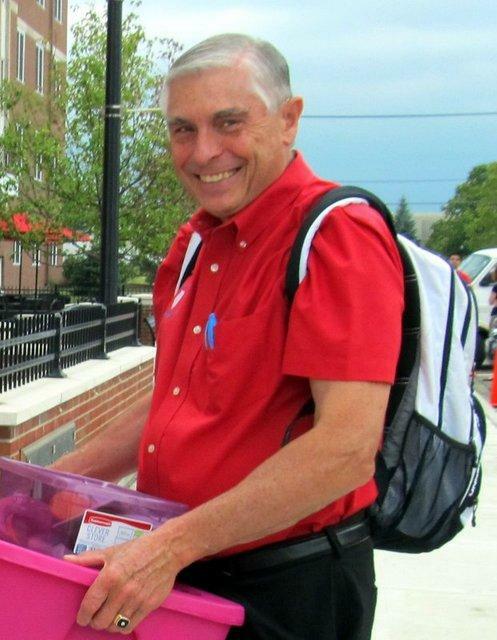 Bob Pritchard helping students on NIU's Move-In Day. Credit Bob Pritchard / Facebook.